BeTheme is a multipurpose premium WordPress template by The Muffin Group, an Envato Power Elite author. One of the most appreciated on the market and the author’s best-selling theme, this template was released in May 2014. 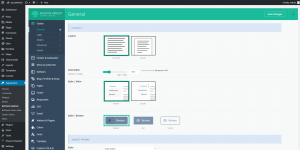 BeTheme comes with a flexible design, performance-oriented functionality, and hundreds of pre-built websites. With so many interesting tools, this template can be the right solution to build any site, from architecture, eShops, food to medical, sports, tech or fashion industries. 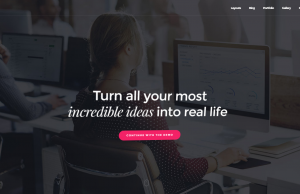 BeTheme is a versatile template that brings you an attractive design. With this theme, you can create a beautiful website without using any code, and, at the same time, delivering a captivating experience for your visitors. Give them an engaging site design, a great content mixed with responsive and retina-ready layouts and your visitors will surely come back over and over to see what’s new. With BeTheme it’s easy to start the building process with examples of ‘One-page navigation’ sites, as these demos are using full width pictures and various elements. 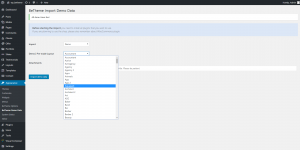 The Muffin Group author has created the BeTheme Demo Data panel to help you import the default layout, a pre-made demo, content, menu with pages, options or widgets, with a button touch. If you select a demo, then a list of over 240 pre-built websites will pop-up, each with its individual design, tools, and feeling. 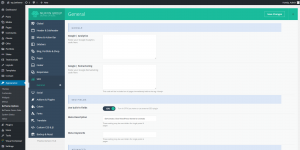 With BeTheme you can enhance the navigation usability on each page by using a different menu and nine styles that you can choose from. The images bring dynamics to a website. With this in mind, the theme authors challenge you to use a custom image background for each page and add an elegant touch with a parallax effect. You can display mega menus, a top sliding area and integrate icons & texts to highlight your great titles. This option also allows you to add a left side menu with a custom background image. 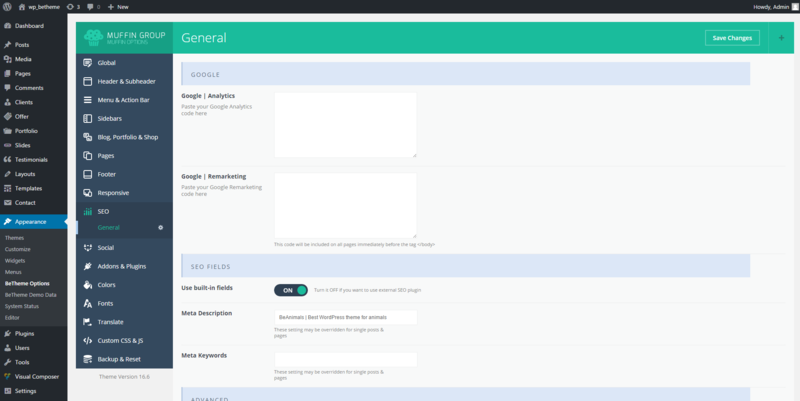 One interesting feature of BeTheme is that you can display as many menu bars as you want, for different pages, and this way you’ll improve the site’s visual impact over the visitors. Also, the menu can acquire one of the nine styles, each with different specifications. You can promote some valuable content by setting up an ‘Action Bar’ above the header section and display your slogan, social icons, phone numbers, email addresses and more. As an important part of its brand identity, the name and the logo of your website are easy to customize in many different ways. You can also modify the bottom area of the website using a predefined layout, and custom adjustments (icons, social networks, image, or column position). As the content makes a website interesting and alluring, BeTheme brings you five post formats, so you can adjust every post with the Muffin Builder, and display it in one of the two post templates available. The images, videos, and sliders are some of the strongest tools you can use to impress your visitors. You can show pictures in a modern lightbox or embed videos from YouTube or Vimeo channels. 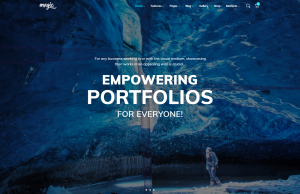 With eight different portfolio and six blog layouts, plenty of headers and custom skins, BeTheme is a highly flexible template designed to enhance the value of your WordPress website. There’s always a good idea to have engaging fonts on your website. On BeTheme Options panel you will find a tab dedicated to typography, and you can customize the Google pack and upload the desired custom fonts. If you have styled your website in general and want to focus on details like the navigation options or related information, just use a sidebar. The BeTheme can display two sidebars at the same time. This option can be enabled only if your page is using a boxed layout. The BeTheme is a social, friendly template, so it is easy to share posts with other people using your favorite online networks. BeTheme has a settings panel called Muffin Options panel where all the essential functions are gathered together. 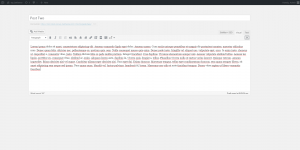 The theme’s author has created a drag and drop page composer, called the Muffin Builder. In the last six months, the BeTheme was highly improved and fixed, so now the Muffin Builder reaches the 3.0 version and comes with a new building system made of ‘wraps’ and dividers inside the section. With the new ‘wraps’ and the search tool, you’ll create new pages or posts easily. With plenty of options, the Muffin Builder helps you have a clean, bright-looking, and fast loading website. Within the drag and drop tool, you’ll find over 60 elements to pick from and include into your content (article box, icons, sliding boxes, maps, tabs or testimonials templates). The Muffin Builder allows you to clone the page sections and the items so that you can reuse them on the same page. Independently from the page composer, you can create slides, testimonials, layouts or templates, and include them in your website through the Muffin Builder. Also, there’s a new feature that hides the admin menu bar and allows you to write content without your attention being distracted by other elements. If you are already used to build pages with Visual Composer, you can still use it, as the BeTheme authors added a bundled license to this plugin in the theme’s files. Many additional shortcodes like hover colors, progress icons, link images and more are ready to be used to make your pages and posts look different. 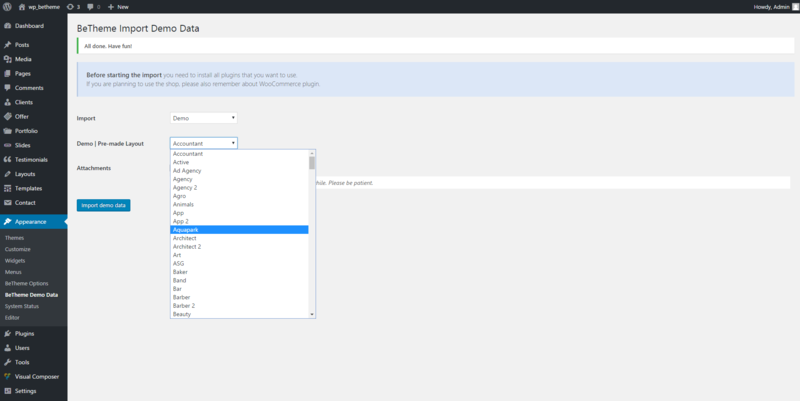 In addition to the .po and .mo files, located in the theme installation package, the BeTheme has a built-in translation panel and an improved RTL writing system. This template comes with six custom widgets, Muffin Tag Cloud, Menu, Recent Posts, Flickr, Login that allow you to show a list of assigned post tags, Flickr thumbnails, menu items, your newest posts or a login form. Bundled with the Revolution Slider and Layer Slider plugins, The BeTheme provides you plenty of elements to help you create a beautiful website. All these elements can be mixed with various animation effects and video backgrounds. The theme is compatible with WPML, WooCommerce, bbPress, Events Calendar, Gravity Forms, BuddyPress, Duplicate Post, Contact Form 7 and other plugins. Some of these are recommended and come with the theme, while other plugins are premium and you need to purchase them. 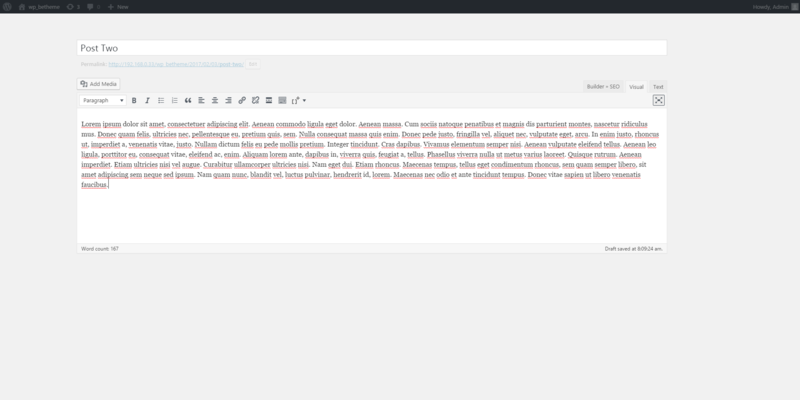 The BeTheme plugins can be updated automatically since the author added the TGM Plugin Activation in the theme files. We have tested the BeTheme default demo on different page speed tests, and it loads the content with a medium speed. The theme has additional documentation about how to improve the website’s performance and optimize it. The theme doesn’t provide a review and a post views system or audio posts. For some WordPress users, these missing features can be a disadvantage. There is no custom theme updater. You can import the updates using the Envato Toolkit. The BeTheme is a mature template and one of the most user-friendly multi-purpose themes, continuously improved and fixed. Every feature is explained in detail in the documentation and illustrated with many screenshots and video tutorials. The BeTheme was designed to suit many activity niches so that both WordPress beginners and advanced users will be inspired to create a new website for their project. Hi sir.Me likes very much the teme BE, lotz of customisations.but I dont know what to site want to built.need help! Hi, Anka! And thank you for your feedback! We are doing our best to give complete and useful reviews for all the themes that we have tested. We are trying to provide you all the information you need before you start building a website. I’m sorry I cannot help you choose the theme of your dreams, but what I can suggest is that you compare the themes that raise your interest and choose one according to your personal and website needs. Unlikely, I am having a very bad experience with this theme. I am using a free hosting (altervista) with pre-built wordpress and it does not seem to work at all with it… I wish I had known it: now I am forced to change the hosting provider (which is more expensive) or to give up the theme (a waste of money)! Hi Ambra! Thank you for sharing with us and our community the experience you had using the BeTheme. Finger crossed to make your website as smooth as possible! Thanks for your message! If you want a simple, yet premium theme for your blog, I would recommend the Newsmag WordPress theme. For more customization options, you can go with Newspaper. Both have ready-made demos, you can easily import and publish your content.